The Tax Cuts and Jobs Act (TCJA), which was signed into law on December 22, 2017, made significant changes to the child credit. This credit is generally available to taxpayers with children under the age of 17, but the new law adds a new (smaller) credit for other dependents. Here are the details. 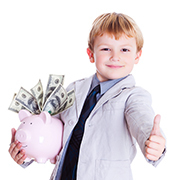 prior tax law, the child credit was $1,000 per "qualifying child." But the credit was reduced for married couples filing jointly by $50 for every $1,000 (or part of $1,000) by which their adjusted gross income (AGI) exceeded $110,000. The phaseout thresholds were $75,000 for unmarried taxpayers and $55,000 for married couples filing separately. To the extent the $1,000-per-child credit exceeded your tax liability, it resulted in a refund of up to 15% of your earned income (for example, wages or net self-employment income) above $3,000. For taxpayers with three or more qualifying children, the excess of the taxpayer's Social Security taxes for the year over the taxpayer's earned income credit for the year was refundable. In all cases, the refund was limited to $1,000 per qualifying child. Important: These "old" rules still apply to tax returns that you're filing for the 2017 tax year (which must be filed or extended by April 17, 2018). For 2018 through 2025, the TCJA doubles the child credit to $2,000 per qualifying child under the age of 17. It also allows a new credit of $500 for any dependent who isn't a qualifying child under age 17. There's no age limit for the $500 credit, but the tax tests for dependency must be met. So, if you were previously prohibited from taking the credit because your AGI was too high, you may now be eligible to claim the credit. But, beware, these phaseouts are not indexed for inflation. To claim the credit, you must include the qualifying child's Social Security number (SSN) on your tax return. Under prior law, you could also use an individual taxpayer identification number (ITIN) or adoption taxpayer identification number (ATIN). If a qualifying child doesn't have an SSN, you won't be able to claim the $1,400 credit. But you can claim the $500 credit for that child using an ITIN or ATIN. The SSN requirement doesn't apply for non-qualifying dependents, but you must provide an ITIN or ATIN for each dependent for whom you're claiming a $500 credit. Thanks to the TCJA, more families will receive tax breaks to help offset the costs of raising kids and taking care of other nonchild dependents. If you have children under 17 or other dependents, contact your PDR tax advisor to determine if these changes can benefit you. The new tax law isn't all good news for families. For the 2017 tax year, you can claim an exemption of $4,050 from taxable income for each qualifying dependent (subject to phaseouts at higher income levels). But that deduction has temporarily been suspended, for 2018 through 2025. Many families still expect to come out ahead under the new law, however. That's because credits reduce your tax bill dollar for dollar. By contrast, exemptions and deductions only reduce your taxable income, which is the amount that you're taxed on. Your tax advisors can help you take advantage of the tax breaks that may be available for raising children and caring for other family members.